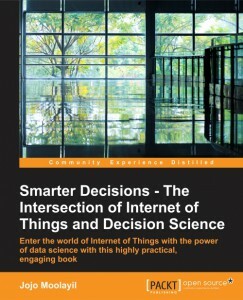 The first of its kind book for Internet of Things (IoT), Data Science and Decision Science enthusiasts is now available for on Amazon. With an increasing number of devices getting connected to the internet, massive amounts of data is getting generated which can be used for analysis. With IoT, the frequency of a problem and impact of the problem is huge. Addressing a problem with such a huge impact requires a very structured approach. This book helps the reader understand the Internet of Things in depth, and solving business use cases in Internet with the help of Decision Science using a mature problem-solving framework. The impact and value in IoT is delivered through analytics. Solving a practical analytical IoT problem by leveraging industry standard frameworks for problem-solving. The book navigates the reader through the entire journey of Inquisitive + Descriptive + Predictive + Prescriptive stack of decision science and Art of Problem Solving. Resurfacing the problem – What’s next?